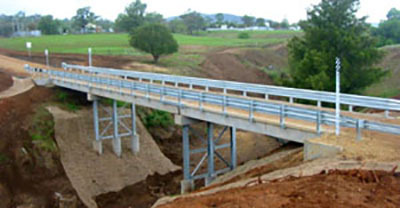 Local Government Engineering Services can provide a range of bridge services. We have designed bridges to AS 5100, carried out design verifications & certifications, as well as managed entire bridge replacement projects. Our clients include the NSW RMS, local governments, universities & developers. We have no affiliation or alliance with any bridge manufacturing companies, and have thus designed and/or managed bridge projects using PSC planks, QLD planks, Super Tees, Doolan Decks, Waeger Bridges, Civilbuild "Faster Cast", Sudholz Precast, and M-Lock bridge systems. Here are some examples of completed projects. Tweed Shire Council - O'Briens Bridge over Tweed River. Design of a 3 x 11m span pre-stressed concrete plank bridge including realigned approach design. Muswellbrook Shire Council - Peberdys Bridge Replacement. Design of a 3 x 14m span pre-stressed concrete modular deck bridge at Hall's Creek. Clarence Valley Council - Fortis Creek Bridge Replacement. Design of a 4 x 11m span M-Lock bridge on Coaldale Road. Byron Shire Council - Opossum Creek Bridge Replacement. 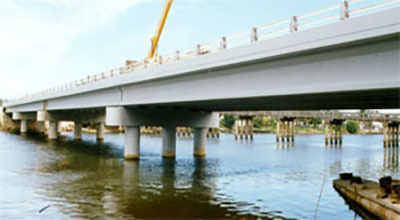 Options report and design of a single 22m span pre-stressed Queensland plank bridge, including road approaches design. Glen Innes Severn Council - Watson Creek Bridge. Design of 2 x 11m span modular plank bridge on Wellington Vale Rd. Tamworth City Council - Oakenville Road Bridge over Peel River. Design verification of 4 x 13m span concrete bridge. Byron Shire Council - Helens Street footbridge. Design review of 3 x 18m span concrete/steel structure. Bridge Design Pty Ltd - Spike Milligan Footbridge. Certification of award-winning design of a suspension bridge over Woy Woy bay. 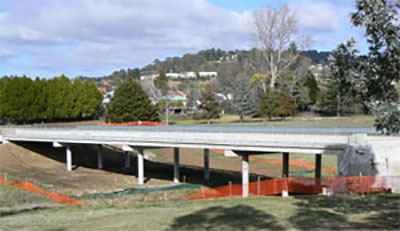 Walcha Shire Council - Middle Street Bridge - project management of a Civilbuild "Faster Cast" bridge. Nambucca Shire Council - Wilson Bridge - project management of a PSC "Super Tee" bridge. Maitland City Council - Trappaud Road Bridge - project management of a 3 x 12m span pre-stressed plank bridge over Wallis Creek.